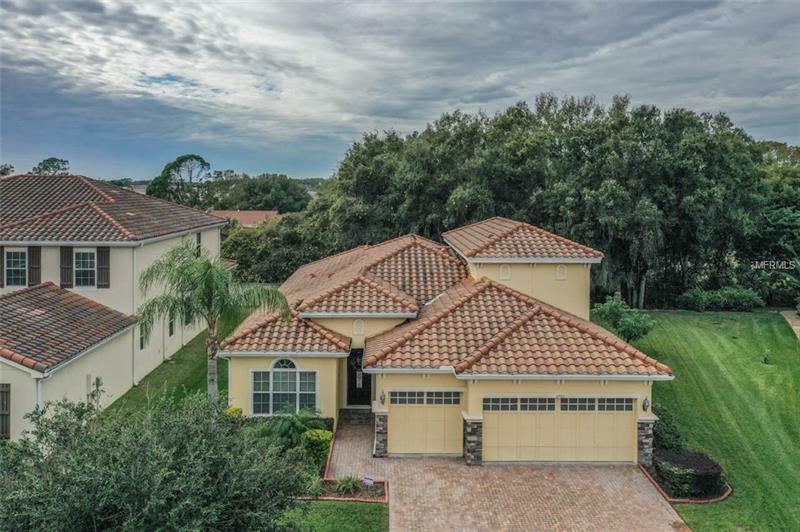 5 bedroom 3Â½ bathroom 3 car garage plus formals and bonus room home in the gated enclave of Waters Edge right off Waters Ave and the Veterans Expwy! This gorgeous home features 3008 square feet formal living room formal dining room eat-in kitchen breakfast nook great room bonus room large ceramic tiles on diagonal crown molding in formals and great room chair rails in formal dining recessed ceilings gourmet kitchen with 42â upgraded wood cabinets w/crown stone counters and stainless appliances! More features are ceramic tiles throughout the first floor wood-laminate floors in the bonus room warm neutral decor blinds throughout wood accents in several areas upgraded light fixtures tile roof brick paved entry driveway and covered lanai/back patio large Master bedroom w/2 walk-in closets tray ceiling and wood accent wall and master bath with dual sinks shower and tub. The split floor plan offers separation from the formals to the great room leading into the patio bedrooms and bonus! This gated entry community features the convenience of being right off Waters Ave and the Veterans Expressway for easy access to downtown Tampa or go north to Land o Lakes and beyond. The Waters Edge community also offers the convenience of area shopping Target Publix Walmart local restaurants & more! Call today for your private tour! Pet Restrictions: Buyer to verify any and all pet restrictions with the HOA as part of due diligence.